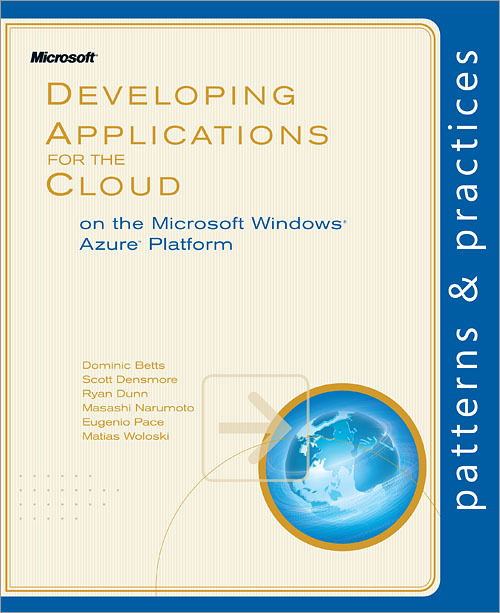 Eugenio Pace is a Senior Program Manager in the patterns & practices group at Microsoft®. He is responsible for developing guidance for migrating and building application for the Windows Azure® platform and for Windows® Phone 7. Before that he worked on architecture guidance for claims based identity and identity federation. You can find his blog here:http://blogs.msdn.com/eugeniopand on twitter @eugenio_Pace. View Eugenio Pace's full profile page. Dominic Betts is a principal technologist at Content Master, part of CM Group Ltd, a technical authoring and consulting company. An expert on developing applications with the Microsoft .NET Framework and Windows Azure™, Dominic has produced numerous training courses, white papers, and other technical material on .NET, Windows Azure, and Microsoft® BizTalk®. View Dominic Betts's full profile page. Scott Densmore works as a Software Engineer at Microsoft®. His primary interests are cloud computing and mobile device computing. You can find him athttp://scottdensmore.typepad.com/and on Twitter @scottdensmore. View Scott Densmore's full profile page. Ryan Dunn is the Windows Azure™ Technical Evangelist and produces the popular Cloud Cover show on Channel 9. Prior to joining Microsoft®, Ryan was an MVP for ASP.NET and Directory Services.You can find him athttp://dunnry.comor on Twitter @dunnry. View Ryan Dunn's full profile page. Masashi Narumoto works on Microsoft®'s patterns & practices team who delivers applied engineering guidance to Microsoft's customers. His primary interests are in cloud computing and mobile applications. You can find him athttp://blogs.msdn.com/masashi_narumotoor on Twitter @dragon119. View Masashi Narumoto's full profile page. Matias Woloski is a Software Architect at Southworks who specializes on identity and cloud computing. For the past 10 years he has been designing and developing software and helping companies to take advantage of emergent technologies. He is a co-author of the "A Guide to Claims based Identity and Access Control". You can find him athttp://blogs.southworks.net/mwoloskior on Twitter @woloski. View Matias Woloski's full profile page.